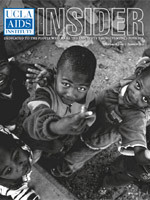 Insider is a 30 page, full color, lay-language publication "Dedicated to the People Who Make the Institute's Achievements Possible." 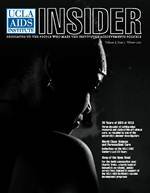 The magazine highlights the many activities associated with the AIDS Institute, from faculty profiles and scientific highlights, to advances in patient care, both locally and globally, to fundraising and health education. Insider is published annually, and circulated to a wide list of recipients, among them members of the UCLA faculty, donors and potential donors, press representatives, and other interested parties.